Since 1948 when the company was established we have developed relations with leading and world class manufacturers resulting in an unparalleled technology and product offering in the field of bearings. As the company has evolved over time we have added adjacent technologies such as power transmission components, seals and specialty maintenance products and services without compromising our specialist role. As Nomo Kullager AB is an ISO 9001 and ISO 14001 certified company, you can rely on Nomo as reliable partner through the entire chain, from initial inquiry, through product selection, application analysis and delivery of the product. We offer our customers in the OEM and aftermarkets specialized engineers and sales specialists communicating in the Nordic languages.With over 115 highly skilled and experienced employees, 14 locations across the Nordics you can rely on Nomo for specialist knowledge close to you. Our head office and central warehouse is situated in Täby, north of Stockholm, Sweden close to Arlanda airport. We can offer you rush deliveries all over the world through a well proven logistic set up. Additional availability can be found in our branch office service warehouses. 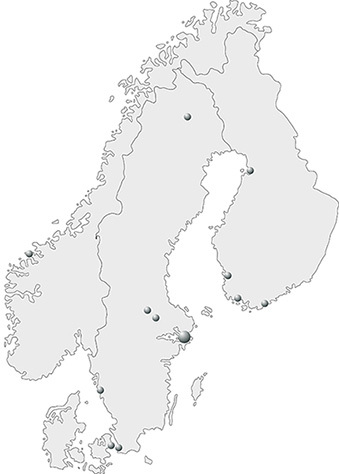 Nomo have branch offices in Stockholm, Gothenburg, Malmö, Avesta, Borlänge, Gällivare and also in Smørum in Denmark, Ålesund in Norway and Pori, Helsinki, Turku and Oulu in Finland. Also a sales office in Shanghai with logistics center in Ningbo, China. The Company has a yearly turnover of over 40 million EURO.